An Associated Press tech writer gives his impressions of the new 360 titles out. If you've scored an Xbox 360, some actual games are going to be the next logical purchase â€” unless you auctioned it off for thousands of dollars on eBay. We've worn our fingers to the bone the past few weeks (just for you) playing through the 18 titles available when the system launched. While the offering is diverse, many of the games are merely visually tweaked versions from the older consoles. Worse, Xbox 360 games can cost a whopping $60 â€” roughly $10 more than games for older systems. Here's our take, from best to worst. "Call of Duty 2" (Rated T, $59.99). Emotional and intense, this World War II epic is the best first-person shooter available so far. In a recurring theme, it costs $10 more than the PC version for no good reason other than it comes in an Xbox 360 lime-green plastic case. But it's an impressive display of the Xbox 360's power: it ran smoother on the $400 console than it did on my $2,500 gaming PC. "Condemned: Criminal Origins" (Rated M, $59.99) This unique, thrilling action title shows the true power of Xbox 360 with some incredible, groundbreaking graphics. As FBI investigator Agent Thomas, you spend most of your time cautiously creeping through dank, abandoned subway terminals and other unsavory buildings filled with urban decay and murderous sociopaths who like to lunge at you from dark corners. "Kameo: Elements of Power" (Rated T, $49.99). Kid-friendly and graphically rich, this is the platformer Microsoft Corp. should have packaged with every new system. Instead, you get to pay $49.99 for this short but fun action game starring heroine Kameo. She has the nifty ability to transform into dozens of nasty monsters, handy for battling monsters and overcoming obstacles. "Perfect Dark Zero" (Rated M, $49.99 for "regular edition," $59.99 for "limited collector's edition"). This futuristic shooter stars gadget savvy secret agent Joanna Dark in a rather confusing tale of corporate espionage. Don't buy this for the solo mode â€” online multiplayer combat with a cool arsenal of weaponry is what makes this game fun. "Project Gotham Racing 3" (Rated E, $49.99); "Need For Speed Most Wanted" (Rated T, $59.99); "Ridge Racer 6" (Rated E, $59.99). This trio has some of the best-looking sports cars available for any video-game system, with a slight edge going to the photorealism of "Project Gotham Racing 3." "Need For Speed Most Wanted" has a hackneyed story but uses a cool mix of computer graphics and full-motion video actors. "Ridge Racer 6" will appeal to those seeking a less-than-realistic arcade-game approach to high-speed pursuits. "Peter Jackson's King Kong: The Official Game of the Movie" (Rated T, $59.99). A long-winded title for a good but short game based on director Peter Jackson's new film remake. Films have a sordid history of translating into horrible video games, but this one manages to break the mold and even lets you play as Kong, though not nearly enough. "NBA 2K6" (Rated E, $59.99); "NBA Live 06" (Rated E, $59.99). By now you've heard about the gee-whiz special effects on Xbox 360 basketball games, like realistic sweat and characters who look like the real thing. "NBA Live 06" looks a bit better, but gameplay is what matters most in a sports title. By that measure, "NBA 2K6" is the champ while "NBA Live 06" is the last-place loser. "Madden NFL 06" (Rated E, $59.99). Visually, it's as if you're controlling a real NFL game on the television screen. But don't let the dazzling graphics fool you: "Madden NFL 06" sacrifices many features found in versions for older-generation consoles, yet costs more. "Quake 4" (Rated M, $59.99). The creators of the monster-infested "Doom" games offer a similar blood-soaked, first-person shooter. "Quake 4" looks great, of course, but there's nothing new here. "Amped 3" (Rated E, $59.99). "Amped 3" presents snowboarding as a cutting-edge lifestyle instead of a mere sport. The sensation of sliding down steep, powdery slopes is convincing. I just wish the controls weren't so, um, flaky. "Tony Hawk's American Wasteland" (Rated T, $59.99). This latest game from skateboarding's superstar looks a bit better on the Xbox 360 than it does on older systems. Otherwise, it's the same game, just costlier. Are you seeing a pattern here yet? "NHL 2K6" (Rated E 10+, $59.99). Another pre-existing sports franchise gets a glossy Xbox 360 makeover and not much else. The version for older consoles is only $19.99 and there's nothing here to justify the $40 price hike. "Tiger Woods PGA Tour 06" (Rated E, $59.99). Great looks again collide with sub-par gameplay. The gorgeous, shimmering water hazards don't make up for the fact that there are only six courses available. "Gun" (Rated M, $59.99). If you own an older system, there's really no reason to buy this Western-themed take on "Grand Theft Auto" for the Xbox 360. Beyond some exciting horseback action, "Gun" isn't much fun. "FIFA Soccer 06 Road to the 2006 FIFA World Cup" (Rated E, $59.99). A pretty but disappointing and overpriced game that has rush job written all over it. Move like a shadow. Strike like a snake. Violent rebellion and civil strife have torn through the heart of 16th century Japan. 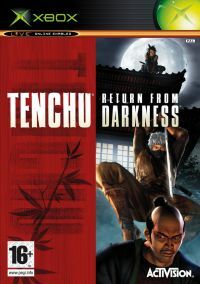 After amassing an army of ninjas and lords of darkness, the mysterious Te..